As I travel across the country to bookstores I'm always stumbling over little obscure bits of trivia and coincidences. Today was one of those days at A Cappella Books in Atlanta. 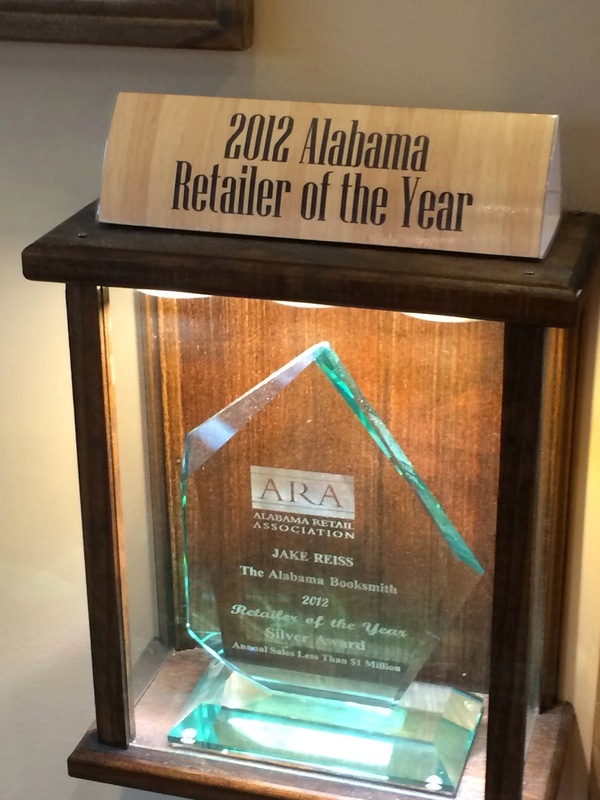 Earlier in the day I was at The Alabama Booksmith near Birmingham, AL and met Jake R., the fine owner there. Then in Atlanta, in the afternoon and some 140 miles away, I met his son Frank R., the fine owner at A Cappella Books. This has been the father-son bookstore tour day. Frank told me though that this ownership lineage will most likely stop with him because his wife probably wouldn't let one of the daughters continue the business. 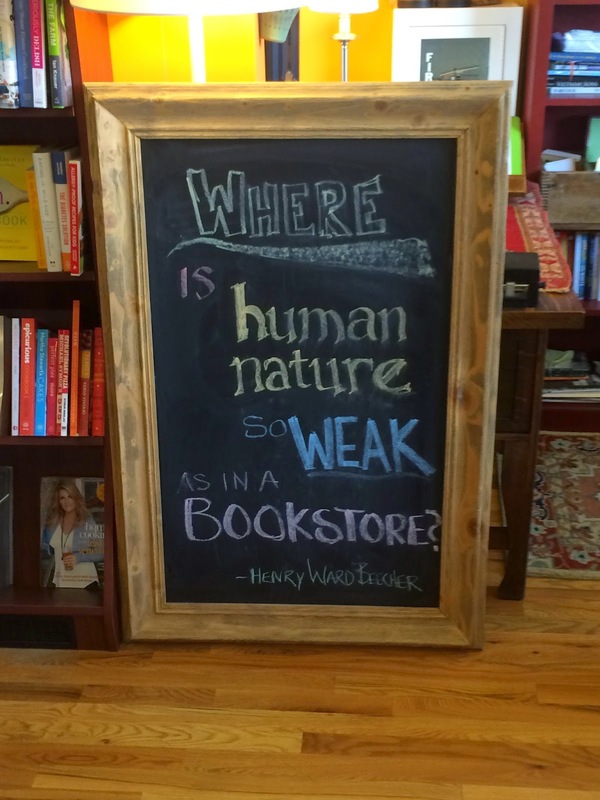 Of course, bookstore lovers everywhere could only hope genetics would suggest otherwise! Frank was just as pleasant and great to talk to as his dad. I don't know how much he's learned from him but he seems just as knowledgeable about the business. Like his dad, Frank has been in the business for 25 years and even though they're in the same profession, they've never worked together. 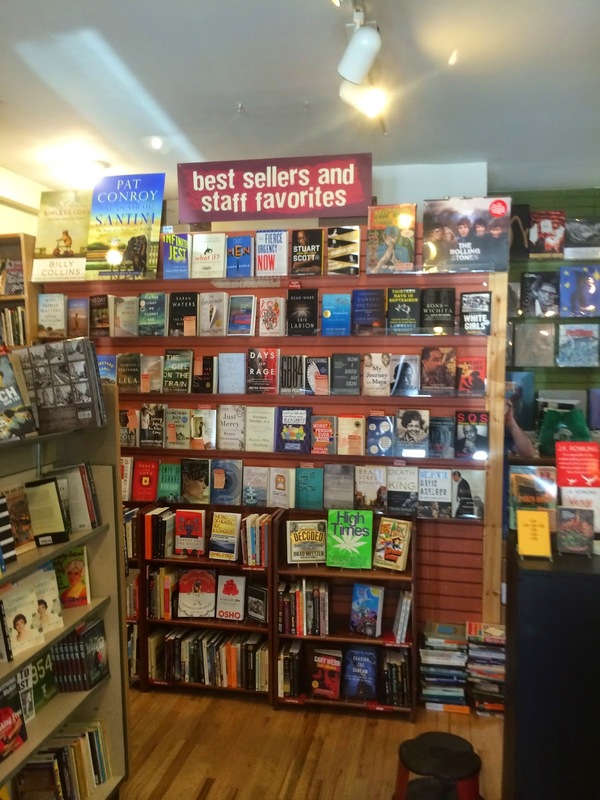 I was encouraged to hear Frank share with me that the business is doing reasonably well and that things are trending upward for independent bookstores in general. This is a small, corner lot bookstore in a largely residential area, the best location this store has had in its 25 year existence. 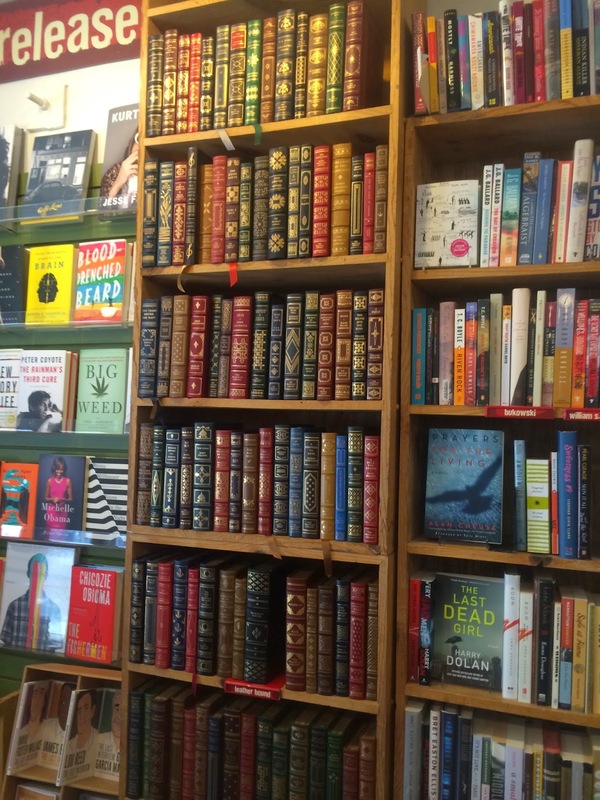 You can get new, used, out-of-print, and vintage books here. They are very selective about the used books they will take but if they do, you'll receive cash or will be able to trade for used books already in the store. They're working on expanding into a room next door for most of their vintage books and will also use this room for author events. They also have a great back patio that can be used for book parties, among other things. Unlike many other indies, there are no sidelines here so the books are the thing. Even though this place is small it packs a punch. It really feels like there are a lot of books here in a small space. And on the day of my visit there was a steady stream of business. 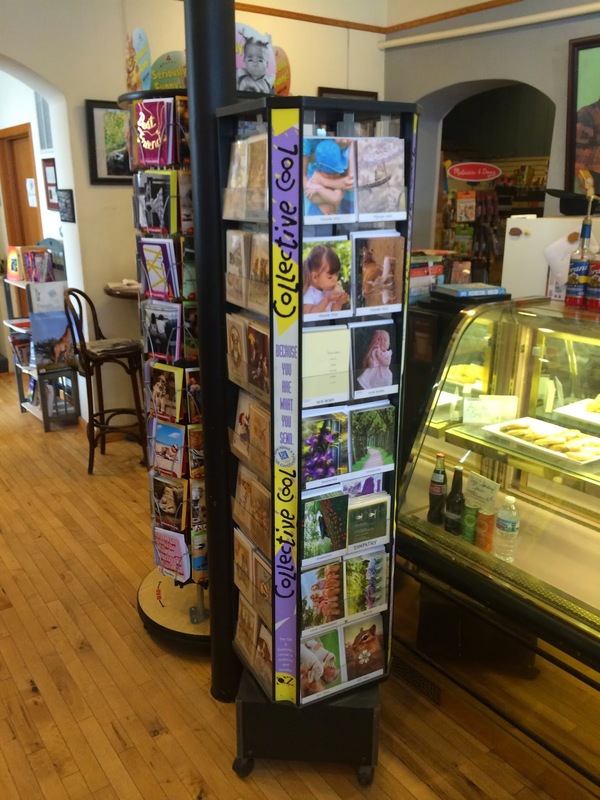 A good nucleus of locals, some tourists, and on-line orders all contribute to the success at A Cappella Books. The parking is free and on the street but you'll be able to park fairly close. If Georgia is the Peach State, I think I just found a "peach" of a bookstore. I know, I know, that's totally corny. It has to be "corny," I'm from Iowa (stop it Indie Bob you're nauseating the readers!). But I digress. 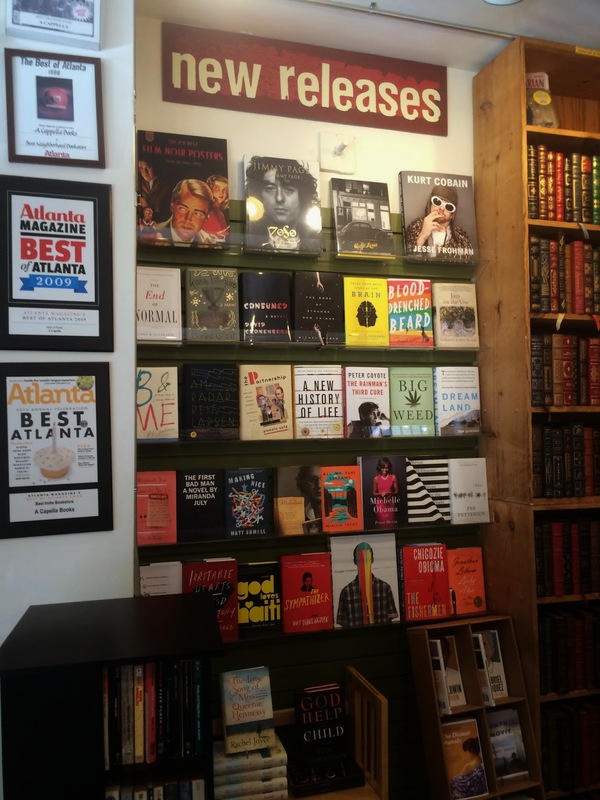 Atlanta is a great destination, and now you have a great bookstore to visit when you go there. Go to an indie and buy a book. Bonsoir. JUST FINISHED: A Prayer For Owen Meany, John Irving. I can see why this is many people's favorite book. Epic and inspirational. Tale of two friends from childhood through adulthood in the Viet Nam years. One of whom has a sense of destiny. Impossible to describe this book in a couple of sentences. Highly recommended. CURRENTLY READING: Flora & Ulysses, Kate DiCamillo. Needed something different after Owen Meany, this is it. A middle-grade reader. RECENTLY PURCHASED: A Stranger In My Own Country, Hans Fallada. Get In Trouble, Kelly Link (you never know when you'll bump into an author in these places! A gift from Han Vance. Thanks Han). GIFTED: A Cozy Infinity, Tony Paris. The story of A Cappella Books. The Pinch, Steve Stern. An ARC. Thanks Frank. Great exterior view and I found a parking place right in front of the store. Looking to the left and a great display of new releases. Always love seeing the staff pick displays. A variety of leather bound selections. From the rear of the store looking toward the front entrance. An additional room which will house the vintage books. In-store author events and writing seminars will be held here. Planning a book party? This is a GREAT space to have it! 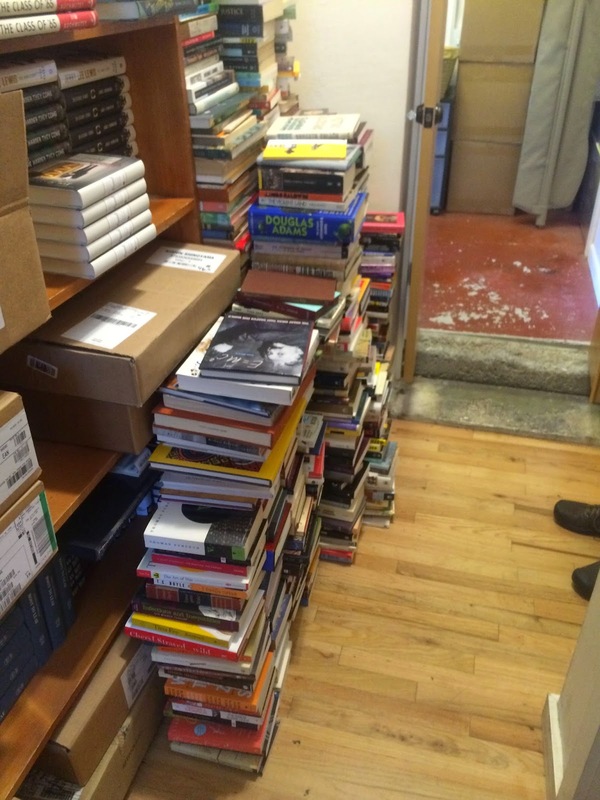 A small portion of the used books waiting to find a temporary home on the shelves until you come in to take one home! 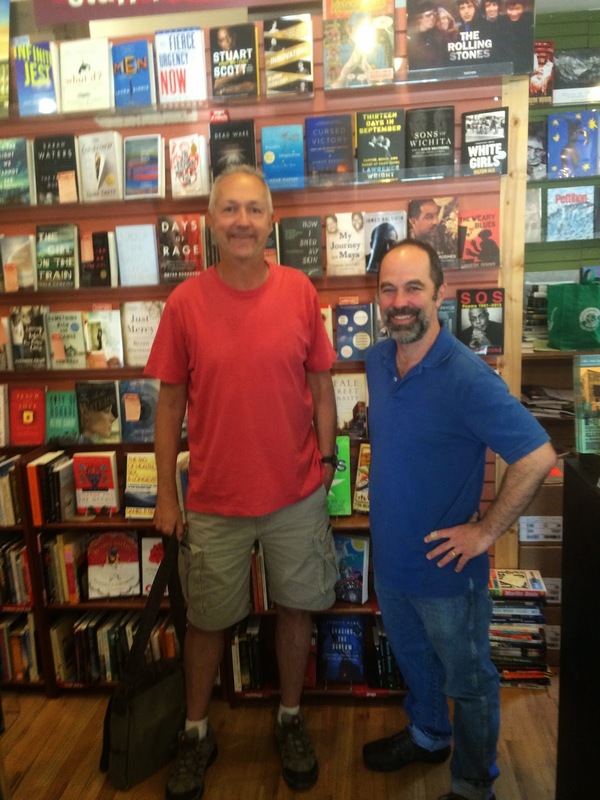 With Frank R., the fine owner at A Cappella Books. Thanks for a great visit! Hey everybody, it's time to welcome a newbie. 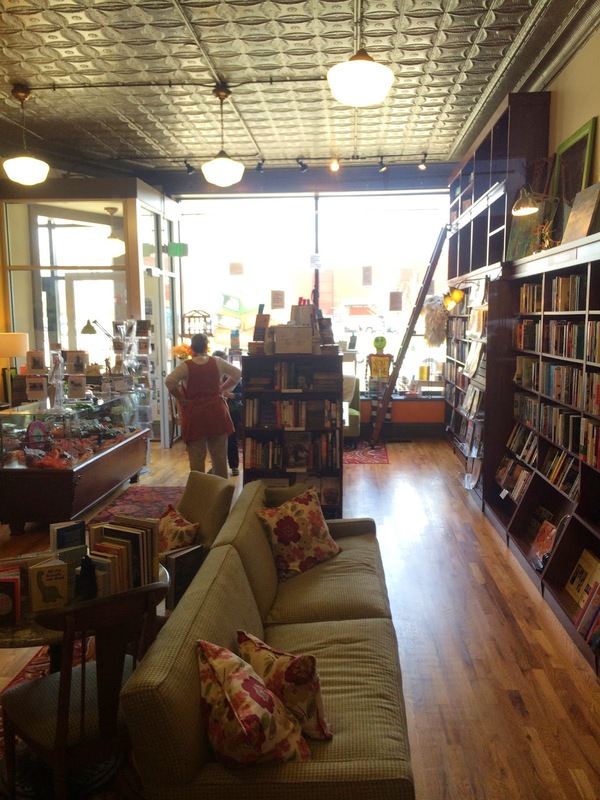 There's a new bookstore under new ownership in Cedar Rapids, IA and according to the owner, Deb W., business is off to a great start. If I were to compare this indie to a human being though, it hasn't even made it to toddlerhood yet. Next Page has been open for less than two months and in people terms that makes this place an infant. There will be growing pains, for sure. Like any newborn, it will need lots of TLC, lots of attention (CUSTOMERS!). And although I have traveled all over the country on my journey to document independent bookstores, this is the one in my town, the one I'll always be able to get to. This town really needs a successful, long-lasting indie and I'm hoping Next Page will be the one. 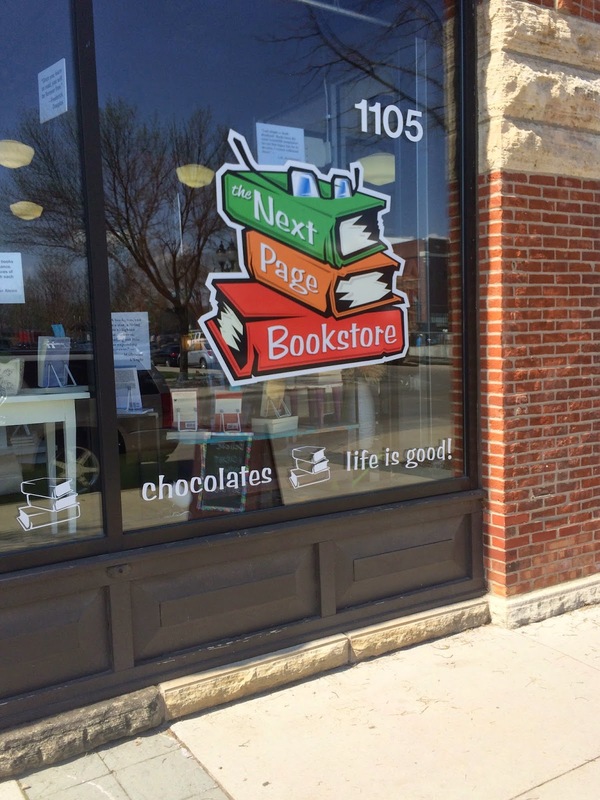 This store is located in the Newbo District of Cedar Rapids, a great location, and occupies the same space as the previous bookstore, NewBo Books. The fine owner of Newbo Books, Mary Ann P., decided to move on and sold the business to Deb. I enjoyed Newbo Books and their booksellers but comparing the two is a bit like comparing apples and oranges. In this case, however, the outer shell is the same but the interior is oh so different. Deb has an incredible flair for design and I hope it shows in the pictures below. The space is definitely bright and cheery. She also does a great job of utilizing the limited space. 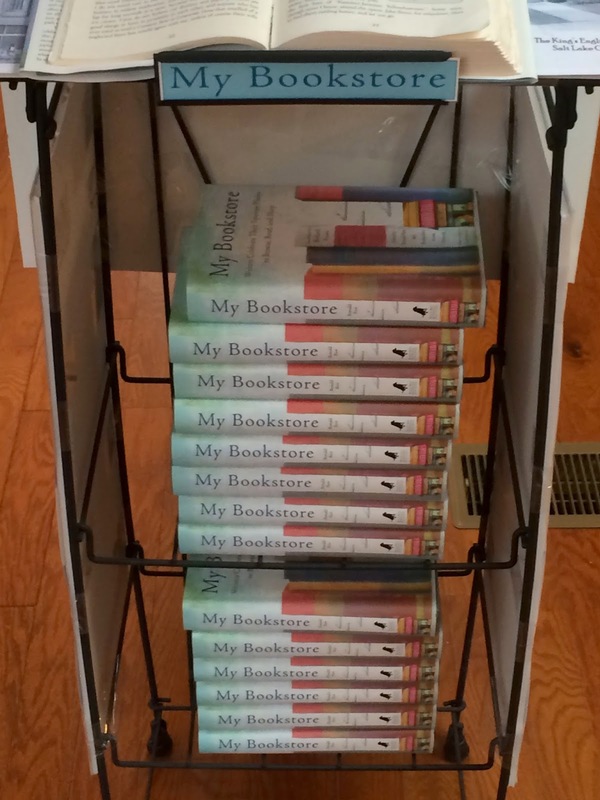 If there are bookstore owners who need some designing tips, you should definitely get in touch with Deb. Despite the small space, I found myself thinking that it seemed like there were a lot of books. As with all new endeavors, Deb is slowly finding her way. There are a few author events on the horizon which will be hosted in-store. 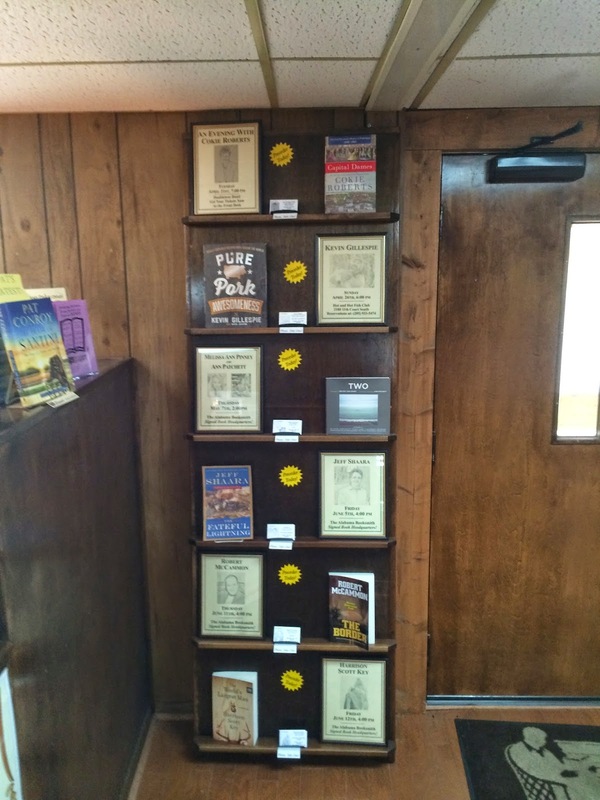 The store sells all new books and has a great display of recent releases right inside the front door. There are a few sidelines here but space will limit what will be available. If you need a coffee or a latté, you can step right next door into the award-winning coffee shop, Brewhemia. Now readers, this is where I have to use my stern voice, especially to those of you in the Cedar Rapids - Iowa City corridor. Look straight into my eyes and hear me in the clearest words possible, PATRONIZE THIS BOOKSTORE! 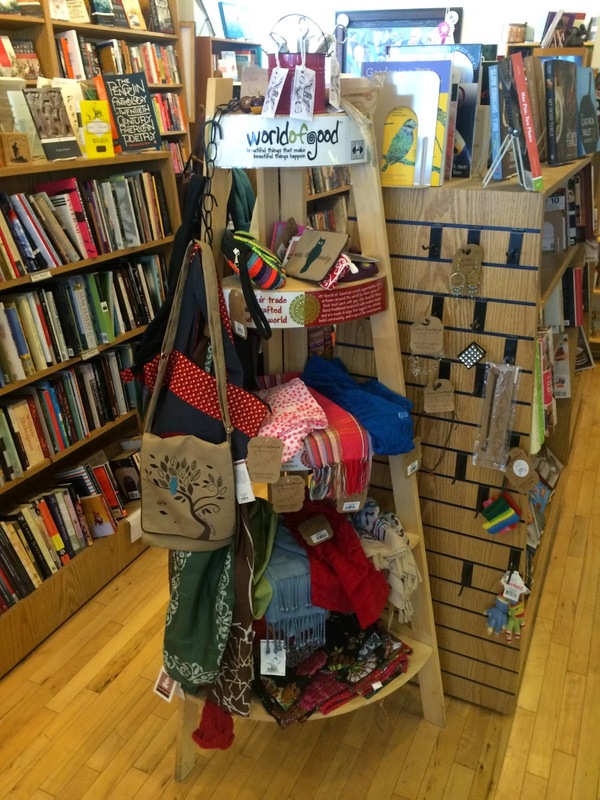 I've been all over the country and seen wonderful indies everywhere. This town needs one too. 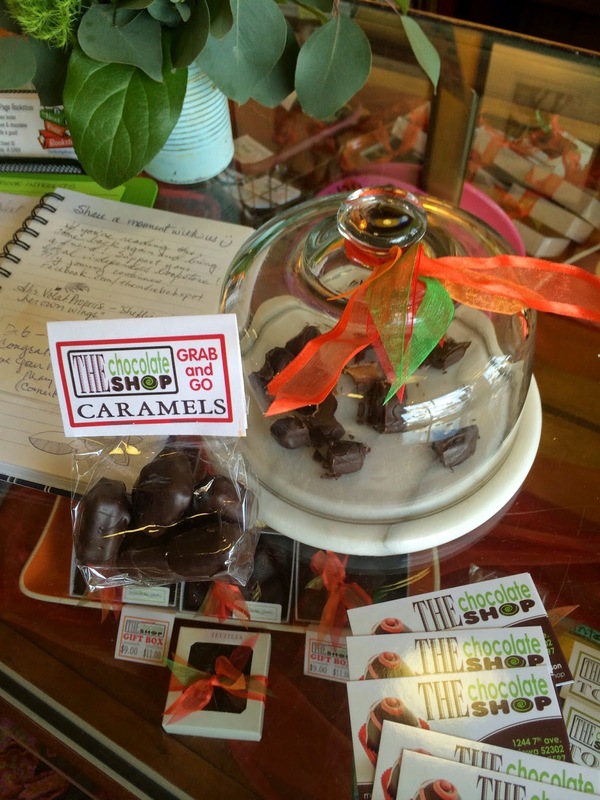 Stop in, check it out, and have a chat with Deb, she's great to talk to. 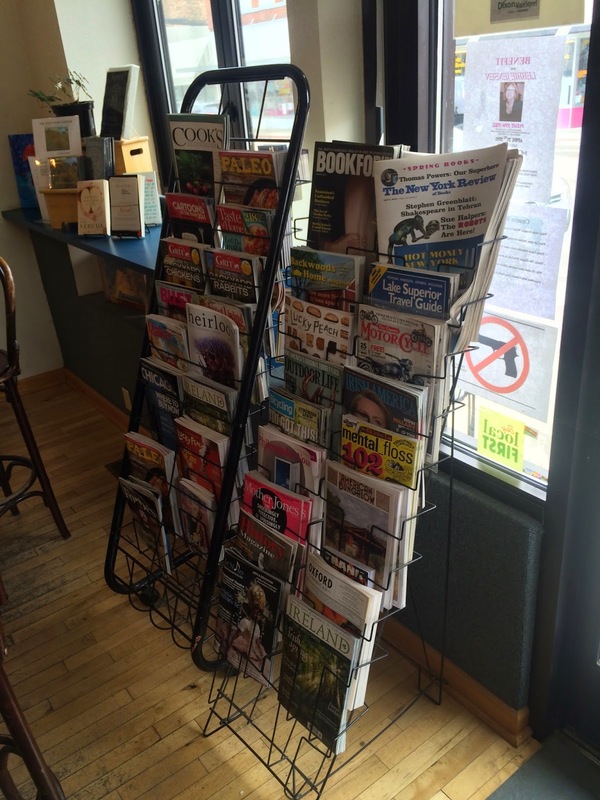 Grab a coffee next door at Brewhemia and then browse some books at Next Page. Support your local independent bookstore. Go to an indie and buy a book. Bonsoir. JUST FINISHED: Dear Committee Members, Julie Schumacher. I enjoyed this book so much I emailed the author. The book is a collection of letters of references from an oddball college professor. He wrote these letters of reference for anybody and sent them everywhere. Absolutely hilarious and he's brutally honest in a very well-written way. This new book deserves more national attention. Obviously, highly recommended. CURRENTLY READING: A Prayer For Owen Meany, John Irving. I think this one is going to be good. RECENTLY PURCHASED: Wolf Hall, Hilary Mantel. View just inside the front door looking toward the rear of the store. A nice place to sit and try a book in the front of the store. Nice table and chairs near the front door. You can't miss the new releases. You'll see them right in front of you when you enter. 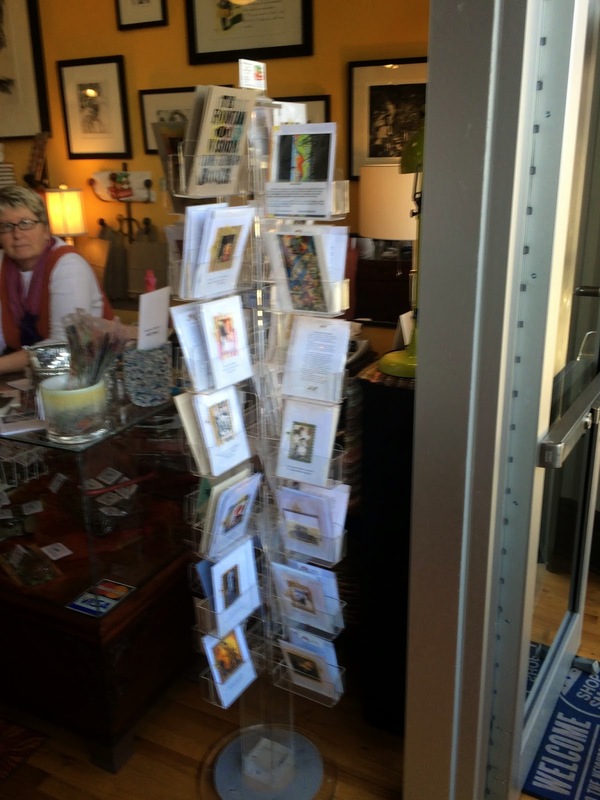 Look for some greeting cards to go with the book gift. One of the sidelines in this display case is chocolate. People, did you hear me? Chocolate! Something to eat with the book you'll buy. I don't know how she's done it, but Deb has done a great job of adding seating areas without making the small space seem too crowded. A portion of the children's section in the rear of the store. View from the rear of the store looking toward the front. This will be the view for visiting authors when they appear here. The furniture will be moved to accommodate folding chairs. Yeah, I think I have a double dose of weakness. Another great place to sit and try a book. You can also find a selection of magazines here. 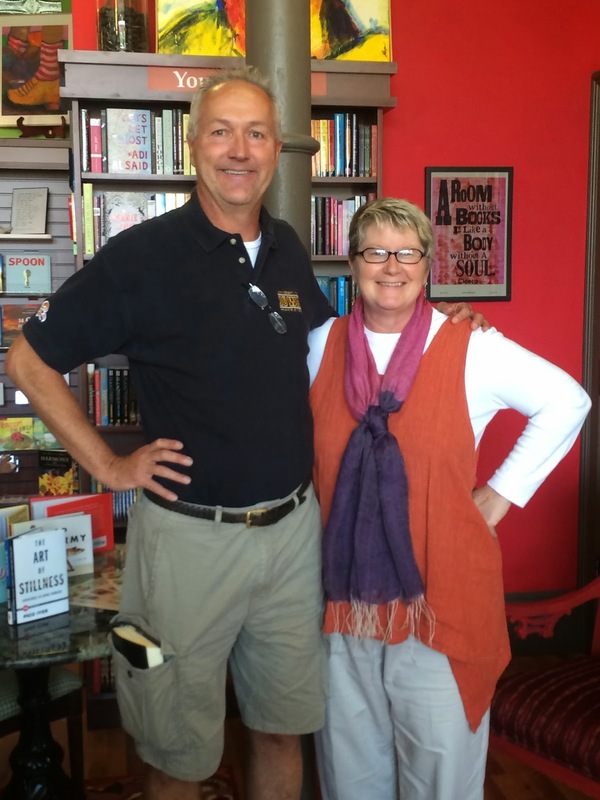 With Deb, the proud new owner of The Next Page Bookstore. Readers, do you remember the lyrics to the "Cheers" TV show? Somewhere in that theme song you hear the words, "where everybody knows your name." That describes Books On First in Dixon, IL perfectly. On the day of my visit, there was a steady stream of customers and everyone knew each other. I was the stranger in a small town of 15,000. But by the time I left, I felt as comfortable as everyone else chatting with the fine owner Larry D., and several of his customers. 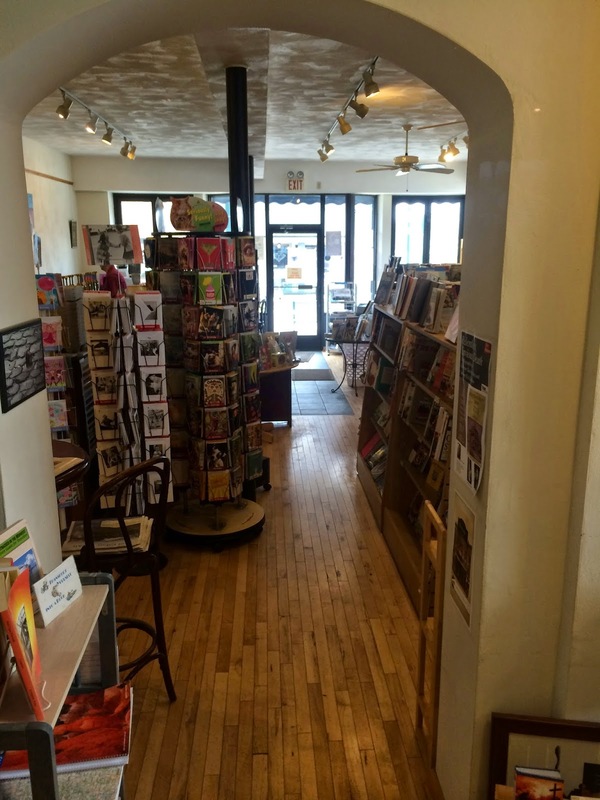 This is your hometown bookstore and you will love visiting here. Larry moved here from Chicago and has been in business successfully for almost 17 years. How can this be? How does this small town of 15,000 (of which 2000 are incarcerated, according to Larry! 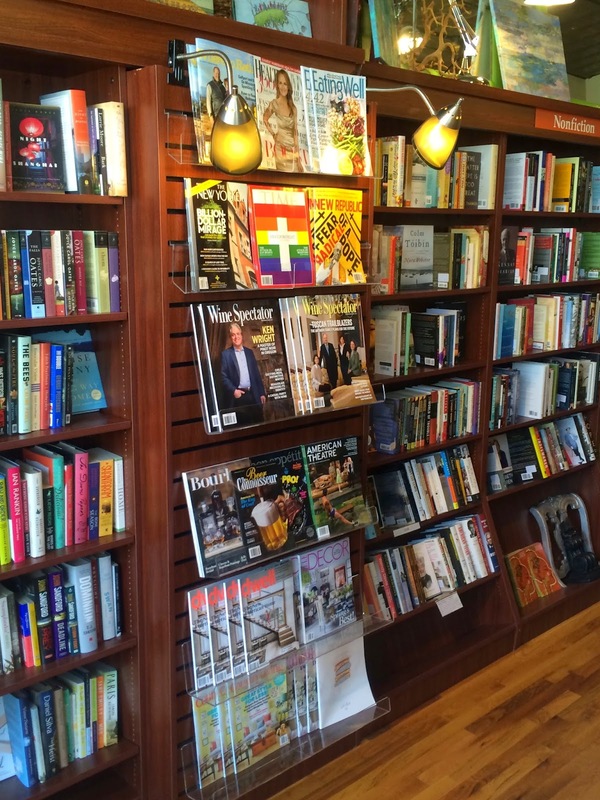 ), support an independent bookstore? Throughout my journey to bookstores, this is always a big unanswerable to me. Here in Dixon, there is definitely strong local support. There are a few sidelines but that is not a major part of the business (One of the sidelines? A dozen eggs. Larry owns chickens, he sells eggs!). It is a great location right in downtown Dixon and Larry owns the building so he doesn't have to worry about rent. One of the best parts of the business is the coffee shop right inside the store. Larry stated they wouldn't be able to get along without that part of the business. 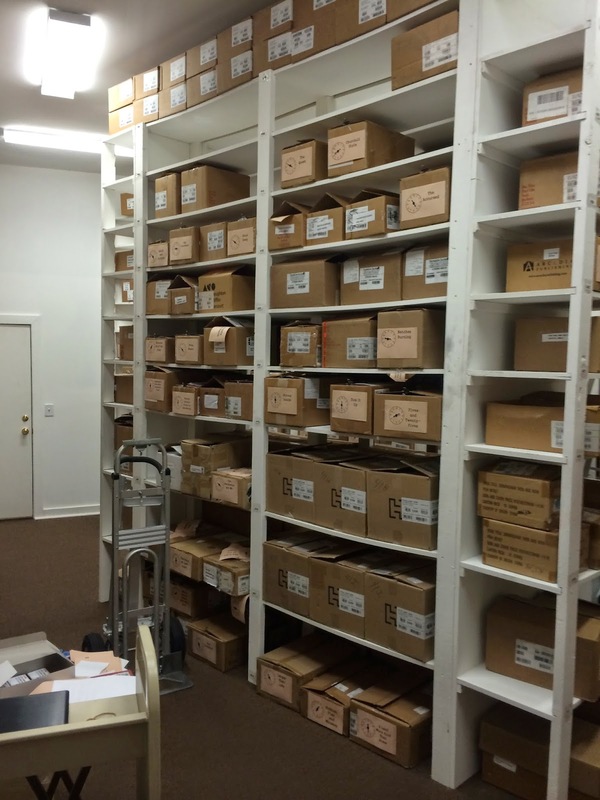 The store is situated well regionally, within easy driving distance of Chicago and other large Illinois towns. But I really liked Larry's response when I asked about his secret to success, "make sure your wife has a good job!" The bookstore itself is a one-level store with new books and a very small collection of used books. The store is divided into two large rooms, one of which is devoted entirely to children. In Larry's words, "thank God for grandmothers!" The children's section looked great. On Saturdays you can come here and listen to live music, a great way to bring people in. The customers I talked to all heartily endorsed this bookstore. One asked me if she could give it three thumbs up! I was saddened though by what Larry told me was his biggest competition, people just don't read as much as they used to. Readers, encourage your children, encourage your grandchildren, talk to a friend about a favorite book. 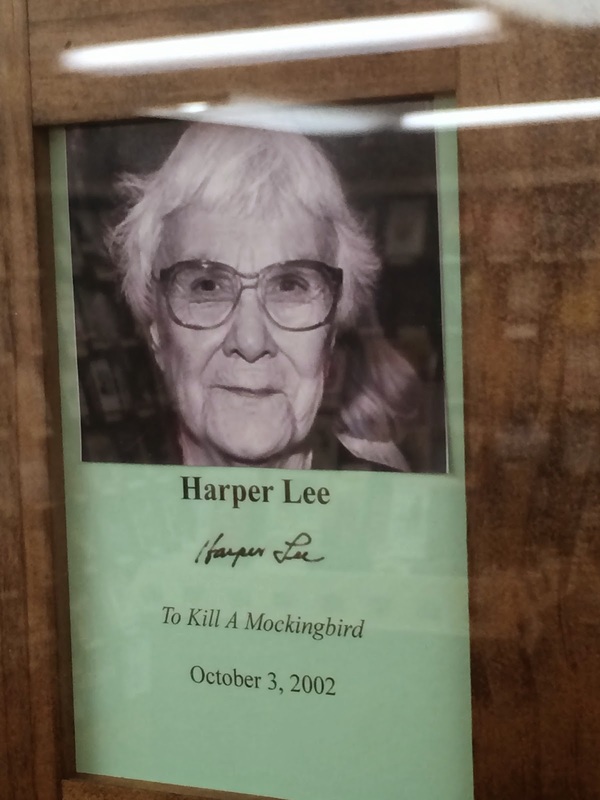 Who knows, maybe you'll inspire someone to visit a terrific independent bookstore in the Illinois heartland. You won't be disappointed. Go to an indie and buy a book. Bonsoir. JUST FINISHED: Three Graves Full, Jamie Mason. Fiction. A guy moves into a house that has two dead bodies buried in the flower gardens, unbeknownst to him. Then he adds one of his own in the back yard. It was ok. A good premise that never really took hold for me. Of course, many others will thoroughly enjoy this. CURRENTLY READING: Dear Committee Members, Julie Schumacher. Loving it. Grab a coffee inside then come out here and take a break. Need a magazine? Look here! It's baseball season and this indie is close to Chicago. Find your Cubs and White Sox books here. Another view from the back of the store looking toward the front. Next door to the main room of the bookstore is this room, devoted entirely to children. This room is where the live music happens on Saturday nights. Another view of the children's room. 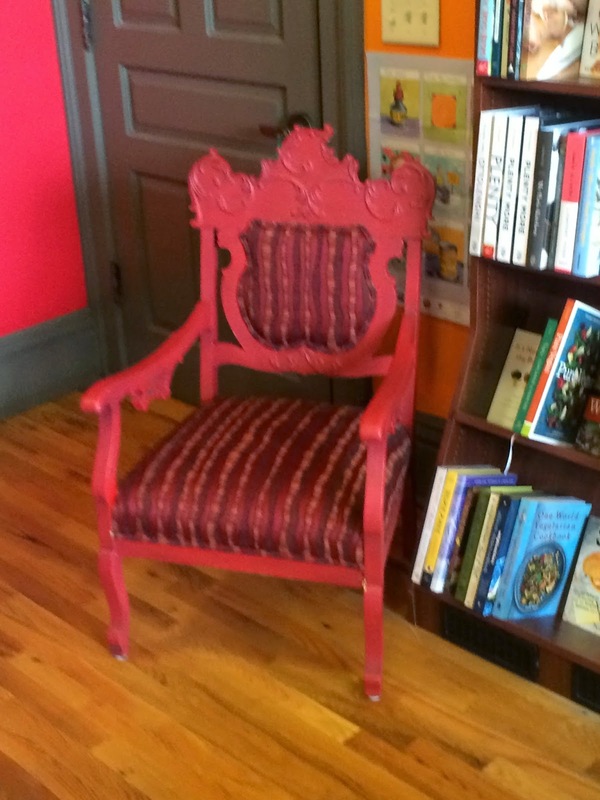 Lots of little chairs for little readers. A few of the kids' books here. Order your coffee here and have a seat at one of the tables in the front of the store. 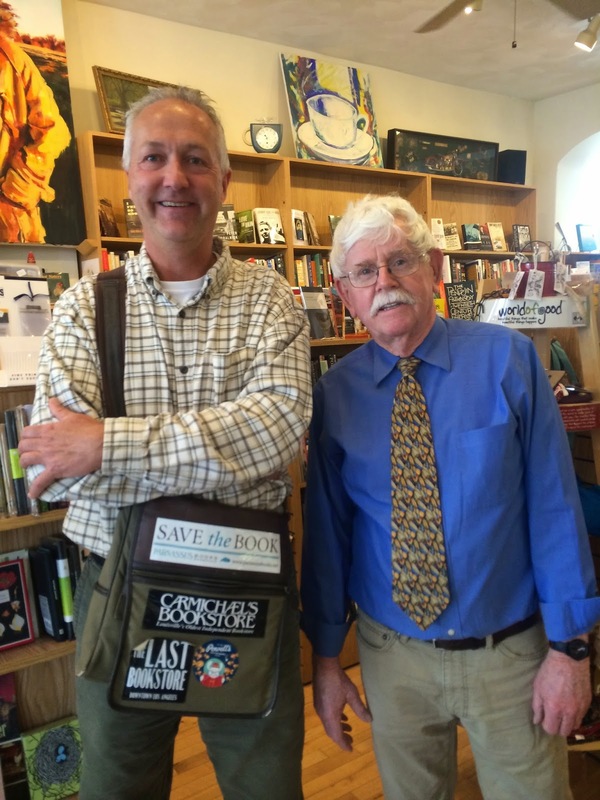 With Larry, the fine owner at Books On First. Thanks for a great visit!